Seeing as how Uncharted: Drake's Fortune is about a quest to uncover ancient artifacts, it seems fitting to imagine the game itself as a piece of history. What might we learn about video games when we view them in the context of design evolution? What does a title convey about contemporaneous player tastes? Imagine the distant future: The year 2030. As you make your way to home from work, you pass a thrift store advertising their selection of video games. "Why the Hell not?" you ask. You engage the maneuvering thrusters on your hover-car and find a parking space. You arrive home with your prize: Uncharted: Drake's Fortune. After dusting off your PS3, you find yourself looking back at the year 2007. While the graphics may pale in comparison to your SONARS (Sony Optic Nerve Augmented Reality System), the game world is remarkably coherent. Waterfalls and foliage are imbued with the same sense of physicality that Nathan Drake, your avatar, exudes. When he climbs over a box or leans against an ancient stone wall, you get the impression that the models are actually interacting with each other. Perhaps this is due to the detailed character animations, or maybe the texture artists out-did themselves. Whatever it is, the game lacks the Hanna-Barbara syndrome: The sense that only some parts of the scene have weight or structure. Just as Yogi and his picnic basket seem oddly more detailed than the background or set pieces, games like Final Fantasy VII and The Legend of Zelda: The Ocarina of Time contained characters and items that seemed to pop out of their environments. Uncharted's world, however, possesses a unified style in which the vine you can swing on and the tree that you simply admire from afar appear equally real. "What the Hell is Yogi Bear?" your kids asks, as she sizes up Dad's latest "treasure." You respond without looking away from the screen: "You know those cartoons Grandpa is always quoting? And watch your mouth." You stumble upon an ammo cache and to your delight, find a grenade. Ready to wreak havoc, you pull the pin with the L1 button, swing Drake into position with the two analog sticks, and promptly throw the grenade at Drake's feet. With a bruised ego and a bruised avatar, you realize that the arc of the throw is controlled by tilting the controller. Why would aiming a grenade require two separate, yet crucial methods of controlling the y-axis while aiming? Throwing grenades is not a groundbreaking gameplay development, so why fix something that is not broken? You are reminded that the Sixaxis experienced some growing pains during its early years. Precision was not the device's strength, and games were generally ill served when they relied on motion control for subtle actions. Thankfully, only a couple years later, the Sixaxis as used in Lair was supplanted by the Sixaxis as used in Flower. 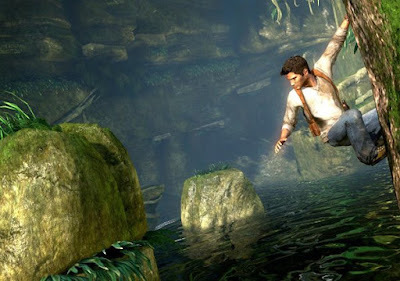 Unfortunately, the motion control in Uncharted seems closer to the former than the latter. All this seems quaint in the face of Microsoft's new holographic projection peripheral, Project Limpopo, but the effective implementation of motion controls (however simple) still makes a difference. A sense of deja vu sets in and, while not altogether unpleasant, begins to dredge up other long forgotten games. You crouch behind a wall for cover and bullets dance above your head, stirring familiar memories. A lucky shot tags you and the colors wash out of the screen. You look through your inventory for bandage, but by that time, is recharged and back in fighting form. A couple of breaks to drive a vehicle or operate a turret carry a familiar scent. You decide that the game just wants to make sure it sidesteps the "one-trick pony" label. Somehow, the boating sequences feel more like a punishment than a bonus, but they end soon enough. A cutscene begins and you put your controller down to get a drink. While at the sink, you glance back at the TV just in time to see a flashing circle and Drake's subsequent demise under a pile of loose pile of rocks. The quicktime event has made its presence known. "People couldn't have tolerated that crap, could they have?" you mutter as you restart the sequence. After all, even Nintendo's Check Balancing Board lets you correct a misplaced decimal without having to re-open the bank statement. The second time around, you make it through unscathed and you cannot help but feel a small, guilty twinge of adrenaline in response. You find yourself musing that despite its quirks, the game was definitely on to something. How often is it that someone could control a Mal-like character in Marcus-like fashion? It might not be a museum piece, but this is a finely crafted experience. There is a certain frankness to it: Uncharted strives to demonstrate narrative cohesion and visual fidelity while incorporating the popular gameplay elements of its generation. Uncharted's successes and failures are more than its own; they are the triumphs and shortfalls of a generation in gaming. Man, the comparison to Mal is so damn apt it isn't funny. Nice pickup there. Uncharted did fly under the radar a bit, unfortunately, so it is interesting pondering how it will be viewed in the future. Ah what am I saying, it already is interesting, especially with the sudden and welcome revisits that some people are doing lately. Add a bunch of people who are only just getting around to the game (us, then)and it's nice to see some people discussing it and recognising what it did or didn't do. Granted, hype for the sequel is probably playing into that a little, but regardless I hope that the recent discussion sets Uncharted's place in gaming history in stone. It certainly deserves it. I think the fact that folks like you and Michael Abbott are still talking about the game definitely made me more interested in playing it. Additionally, the existence of the sequel actually pushed me play the original, since I figured that the fact that it garnered a sequel meant that there must be something interesting going on!